I felt compelled to write something about Greggs marketing after seeing their new video this afternoon. I am always happy to celebrate truly creative marketing and I might even try to shoe horn a few things book marketers can learn at the end. Let me leave you to enjoy the new Greggs video first. I think this is genius and works on many levels - it manages to promote Greggs's new food range brilliantly whilst debunking the snobbery around their brand. They have coerced non-traditional customers to try their food and give honest reviews. Obviously they are the victims of this marketing prank, but I think this is done with such humour that they get away with it. I can only assume the marketing objective was something along the lines of - We need to broaden our customer base and encourage new food-lovers into our cafes to try our food. The 75 year-old Greggs brand has stuck firmly to its original values of providing tasty snacks at low costs. So, how do you market sausage rolls to posh people? What you don't do is offer samples outside Gregg cafes. These 'discerning' foodies made up their minds about Greggs a long time ago. I doff my cap to the marketer who came up with the idea of sampling their food at an artisan food festival. The Gregory & Gregory branding completes the ruse. The foodies glowing praise of Greggs food is a perfect example of how context influences our experience. Would they have enjoyed their samples stood on the pavement outside of a Greggs cafe? Of course not. I suspect they wouldn't have even tried them. Huge kudos to Greggs for expounding the snobbery around their food with such wit. This video follows other fantastic marketing from Greggs. They partnered with OpenTable to offer Valentine's dinner for two. Who could resist a four-course meal plus a bottle of Prosecco for £15? This time they challenge when people would choose Greggs food - not just hungry workers on their lunch break, but a romantic dinner with your partner. They created a video that would get people talking and sharing the joke. Humour used deftly once again. 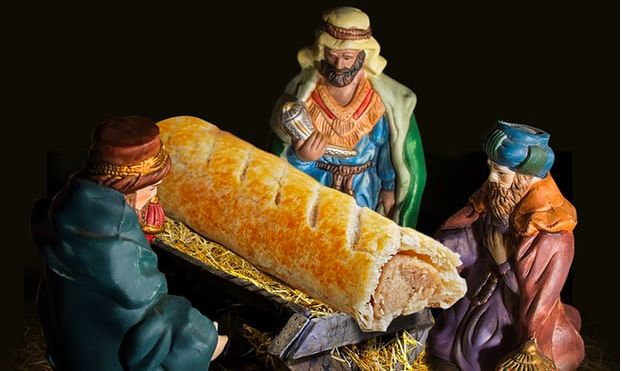 And then finally, they pushed their marketing even further at Christmas with the sausage roll nativity scene promoting Greggs's advent calendar. Worth repeating - a Greggs's Advent Calendar. Who thought of such a thing? And what a laugh to buy one for a mate or family member? As one would have expected, not only did the sausage roll Jesus go viral it also created huge controversy (which I am sure was expected). In pure marketing terms, the costs of these campaigns are negligible, yet they travelled far and wide, got people talking, enjoying a joke, whilst staying true to their products and values. The Holy Grail of marketing, if you will. And what can us book marketers learn from Greggs? Quite a bit actually. As the old marketing adage says - sell the sizzle not the sausage, could not be more apt in this case. Our challenge as marketers is to find ways to market the experience and not the product. In my opinion, we predominantly market the product in our industry - the book. The sausage roll equivalent of 'If you love our pork sausage roll, you'll love our all new chorizo roll.' There's a place for this, but it really isn't that interesting is it? what emotions do our books stir? what preconceptions can we debunk? can we challenge the context or timing of when people read? can we use humour to reinforce the many qualities the reading experience give? can we poke fun at ourselves and take people with us? and ultimately, how can we market reading, as well as books? This has been great fun to write and I really hope you've enjoyed reading it. If you'd like to comment, please do below. And if you'd like to receive my free book marketing newsletter, you can sign up here.